Star Trek has a rich trove of enemy alien races and organizations that have plagued our heroes throughout the many films and TV shows. Aside from being formidable, many of the opponents featured in the beloved sci-fi franchise were actually more complex and layered, which is why they resonate so much with fandom. These are the best of the lot and hopefully we’ll see some of them again when Star Trek: Discovery premieres next year. 10. The Breen Confederacy: Little is known about this warlike, enigmatic race who wear fully enclosed refrigeration suits. Even their speech is undecipherable. Often mentioned in Star Trek shows they never appeared until the Star Trek: Deep Space Nine episode “Indiscretion” and later allied with the Dominion in the war against the Federation, Klingons and Romulans. This resulted in a Breen attack on Earth that destroyed Starfleet headquarters and set back the Federation war effort against the Dominion. This alone proved the Breen are a deadly adversary to be reckoned with. 9. 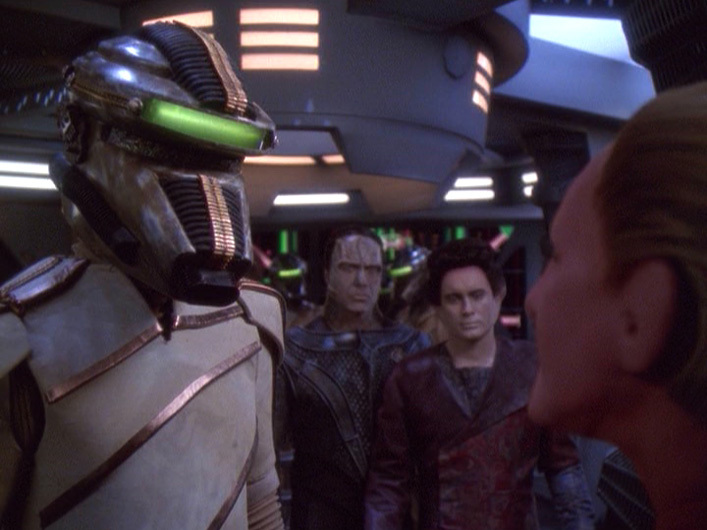 Species 8472: The nearly undefeatable Borg met their match and then some when they tried assimilating Species 8472. In their first appearance in “Scorpion, Part I” (Star Trek: Voyager), the three-legged aliens shocked viewers when they easily wiped out entire Borg cubes. As one of the most alien-looking enemies featured in Star Trek, Species 8472 stand out due to their weird physiology and use of biotechnology; plus the fact that they kicked the Borg’s collective butts. 8. The Xindi: Made up of five distinct races, the Xindi inflicted a 9/11-type of attack on Earth in the Star Trek: Enterprise episode “The Expanse”. 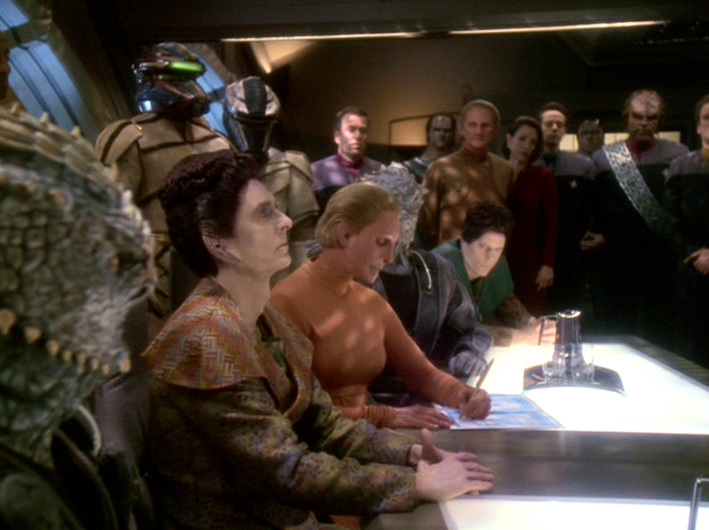 The crew of the Enterprise entered Xindi space in a season-long storyline to prevent the race from destroying the Earth. 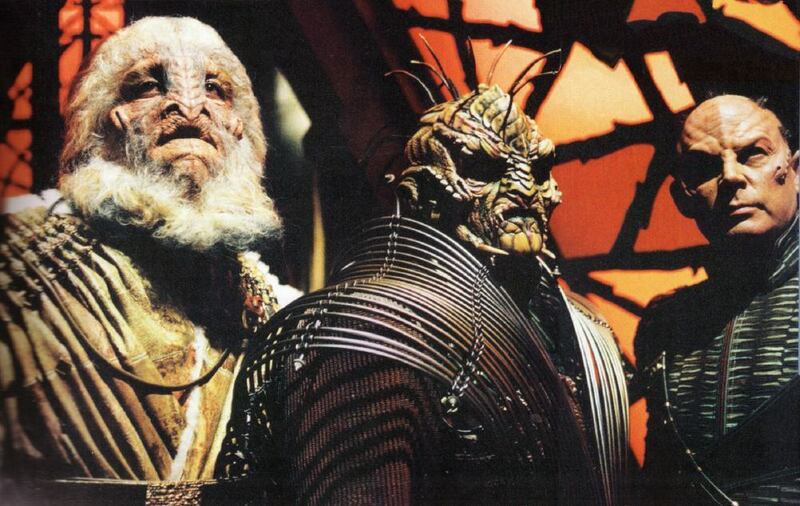 The Xindi can be thought of as a prototype of the Federation due to the diverse makeup of their member races: reptilian, aquatic, insectoid, primate and arboreal. Eventually, we learned that they are just as diverse in their beliefs in that some factions are more warlike while others are more reasonable. This enabled Captain Archer and the Enterprise crew to win over some Xindi members. But others continued with their final attack on Earth and had to be stopped. 7. Terra Prime: An unfortunate fact is that even in the near-paradise future of Star Trek the worst enemy is us, humanity. Many Star Trek stories dwelled on evil humans and organizations, whose antagonistic belief system ran counter to the more enlightened humans in Star Trek. Out of the many nefarious examples like Section 31, the Mirror Universe inhabitants, and rogue Starfleet officers the worst of the bunch is Terra Prime. Led by John Frederick Paxton, they are a xenophobic terrorist group in the 22nd century that wanted to isolate Earth and humanity from the galaxy and keep out all alien influences…sounds familiar? Terra Prime only appeared in “Demons” and “Terra Prime”, which were among the final episodes of Star Trek: Enterprise. If the show had continued they would have made a perfect adversary as Earth began its first steps towards forming the diverse Federation. 6. The Vidiian Sodality: If anything the Vidiians are the grossest looking enemy aliens to appear in any Star Trek. We never saw much of them in Star Trek: Voyager. but they were still unforgettable when they did show up. 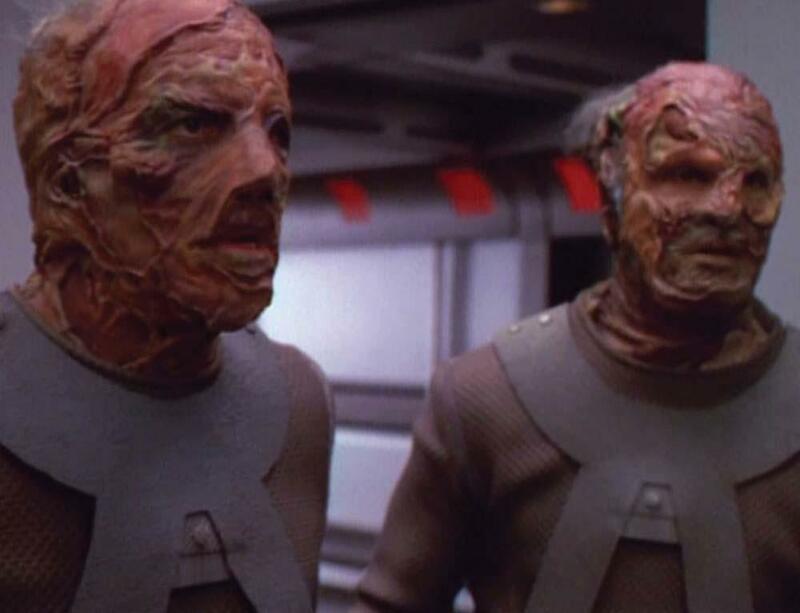 First introduced in the episode “Phage” the Vidiians are a race suffering from a deadly disease that ravages their bodies. In order to stay alive they graft onto themselves body parts from other races, which explains their hodgepodge look. What makes them so scary is that they just see other races, including us, as resources to cull. Most of them do not think twice as they carve up their victims and distribute their body parts to other members of their race. To them, the fact that they are saving other Vidiians easily justifies their actions while it horrifies everyone else. 5. 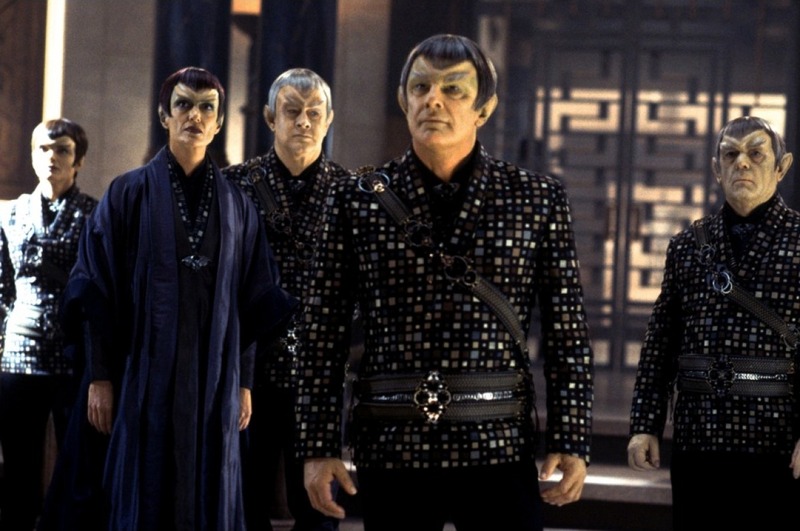 The Romulan Star Empire: On the whole, the Romulan Star Empire are the go-to totalitarian enemy in Star Trek. Stories dealing with them are basically commentaries about the Cold War in that the Romulans are bitter rivals of the Federation. An uneasy stalemate existed between the two powers as both were equally matched, but there is something more about this race of Vulcan offshoots. This was seen in their very first appearance (“Balance of Terror”, Star Trek), as we met an unnamed Romulan commander who played a cat-and-mouse game with Kirk and the Enterprise. He was Kirk’s equal in terms of cunning, but was sympathetic due to his weariness about war and devotion to duty. Throughout their many appearances in the Star Trek shows, the best episodes about them were the ones that had them as fully fleshed out people who weren’t quite evil but happened to be on the other side. 4. The Cardassian Union: Once highly enlightened and cultured, the Cardassians became militaristic and harsh in order to survive. Their totalitarian ways led to conflicts with other space-faring powers like the Federation. Their prejudiced beliefs about other races also justified their brutal occupation of the planet Bajor as they stripped that planet and its people of its resources. 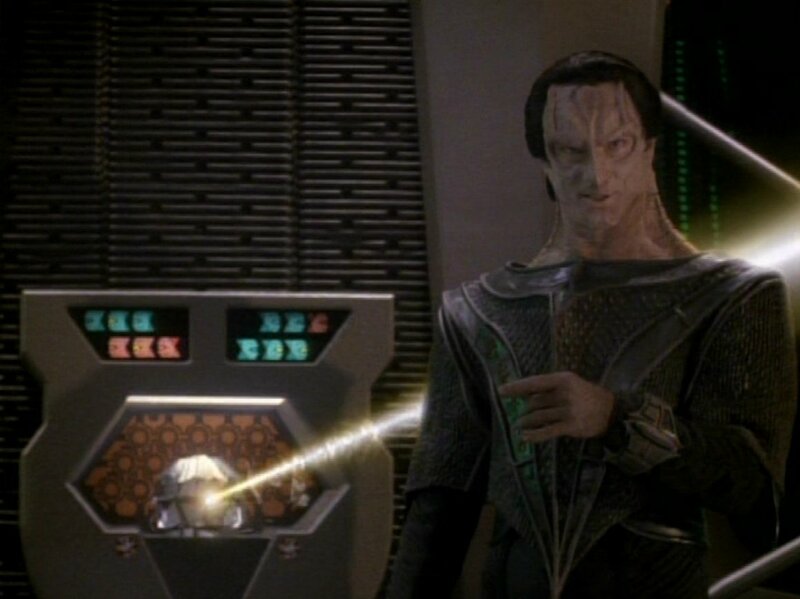 Although they first appeared in Star Trek: The Next Generation (“The Wounded”), the Cardassians were fully developed in Star Trek: Deep Space Nine as one of the main adversaries. What set them apart from other villains was their love of intrigue and desire to regain lost glory, as well as their distinct look with grey and scaly skin. That show’s best stories showed that Cardassians had deep, nuanced and complicated viewpoints as they struggled to find their place in the galaxy. 3. The Klingon Empire: Arguably, the most popular alien race in Star Trek, the Klingons are the perfect antagonistic foil for the peaceful Federation. They first appeared in the classic Star Trek episode “Errand of Mercy” and like the Romulans, they are supposed to represent the West’s Cold War rivals. Known for their harsh and warlike demeanor, the Klingons actually have a complex code of honor and a rich culture. Backing up their brutish reputation, the Klingons are a militaristic match for the Federation with a fearsome fleet of warships and they are all too eager to prove their mettle against anyone. Even though they were the opposite of the Federation, the Klingons eventually became solid allies by the time Star Trek: The Next Generation came along. In the Star Trek spinoffs, more aspects about these noble savages were explored and we realized there was more to them than their love for fighting. That is why they have become so popular to the point that a real-life subculture has emerged that emulates the Klingons. 2. The Dominion: In many ways the Dominion can be considered the dark version of the Federation. They are composed of several different races, the most prominent being the shapeshifting Founders, the deceitful bureaucratic Vorta and the battle-hungry Jem’ Hadar–the thuggish muscle of the Dominion. But unlike the benevolent Federation, the Dominion are brutal conquerors, who only see other races as adversaries to defeat. Their presence was alluded to in early episodes of Star Trek: Deep Space Nine as the Federation began exploring the distant Gamma Quadrant. 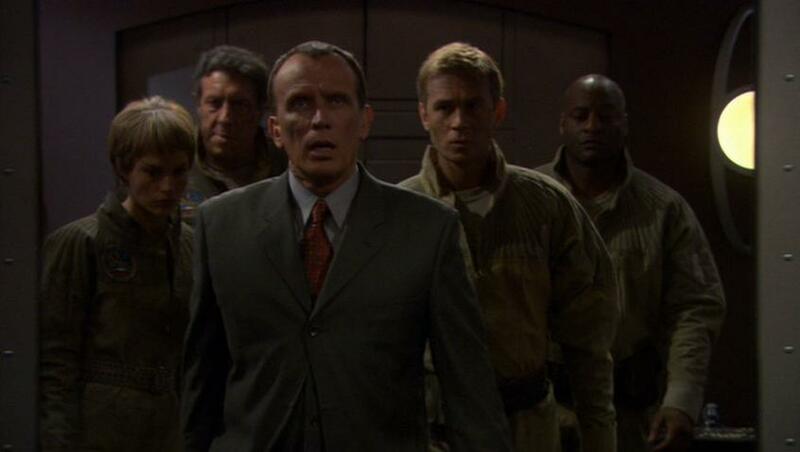 This raised interest among viewers as to who they were, and they got their answer in the episode “The Jem’Hadar”. From the start the Dominion (represented at first by the reptilian-like shock troopers) demonstrated their ruthlessness and mantra to win at all costs. The Dominion soon proved that they were superior to Starfleet in battle tactics and weapons. When war eventually broke out, the Dominion decimated both the Federation and the Klingons. The fact that they came so close to nearly conquering the Federation is why the Dominion rate so highly on this list. 1. 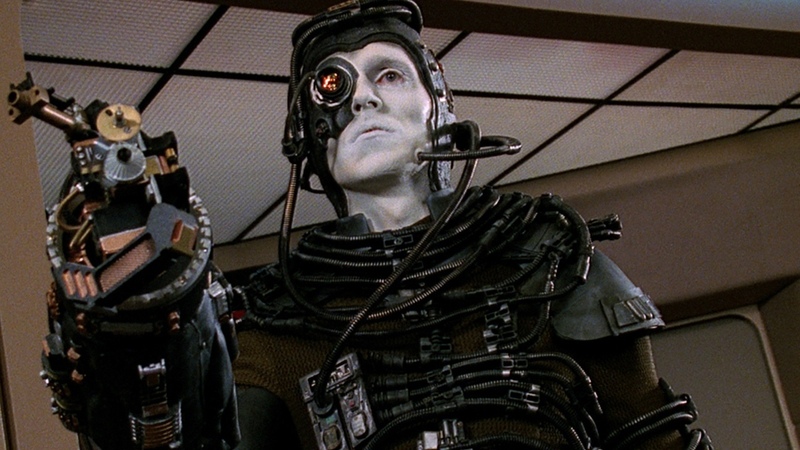 The Borg Collective: Ever since the cybernetic race first appeared in the Star Trek: The Next Generation episode “Q Who?” they have thrilled and terrified fans. What is so frightening about them is their cold, adaptable nature. They forcibly assimilated other races they encounter and add their distinctiveness to their collective in a goal of achieving biological and technological perfection. The Borg made an instant impact in their first appearance in how they quickly outmatched the Enterprise and would have assimilated the crew if not for the fact that Capt. Picard had to eat crow to get Q to save them. They are a relentless threat and what makes them more terrifying apart from the other Star Trek races is encountering them means a loss of one’s identity. Whenever they assimilate their victims and forcibly graft cybernetic parts onto them all traces of their personality are gone. By transforming victims into mindless zombies, the Borg turn anyone against their former friends and colleagues. This is something that the Enterprise crew grappled with when Captain Picard was assimilated and used Starfleet’s tactics against the Enterprise and the Federation. Now, now let’s be civil!